I complain about my lack of stats now and again. Here’s my new year’s whinge. As I watched my WordPress stats disappear into the ether, the term “Phoenix rising from the ashes” popped into my head. 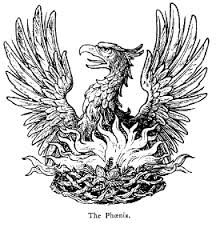 The phoenix is a mythical bird that lives for 100 years, then combusts and is reborn in all its glory. That’s pretty much all I know so how the bird amuses itself between times is a mystery to me. But there’s no mystery about my stats. Every day at noon they too disappear in a puff of smoke; no glory involved or guarantee of a rebirth, unless you want to count a handful of happy returns of the day. All that hard work then it’s shoulder to the grind once more, followed by an uphill battle to get the stats back off the ground. It’s dispiriting, And as useless an exercise as the labours of Sisyphus. Actually I can relate more to the former king of Ephyra than a flaming bird unless it’s barbecuing on a spit and basting in a bit of Peri Peri sauce. I coddle my babies along like a mother hen, then go hunting for their brothers and sisters following the likes and comments to their source. My attempts to entice them over with my bloggy dance is lamentable and the results fleeting. They come, they see and I do not conquer. Two visitors and five views in one day; I don’t know how to divide the honours or who has bestowed them. No one ever says. Occasionally there’s a follow, but in that case I also don’t get to know why as there’s rarely a comment to explain or exclaim. In my saner moments I wonder, as many have before me whether it’s worth all that effort for such little return. Then I remember many of the kindred spirits I have met. Charles Gulotta, for example http://mostlybrightideas.wordpress.com has entertained me with his columns for two years. He must have had such a moment when he finally came to the conclusion that selling his books was uphill work and not worth the bother he put himself to, to create those delicious articles. Charles has given up the bloggy ghost, so have Maddie Cochere http://breezybooks.com and Time Thief for a time http://thistimethisspace.com, http://onecoolsitebloggingtips.com although the latter has made a limited comeback and the former is having a rethink. Maddie is a prolific writer of cosies and has produced two series so far. It’s not easy to categorise, Time Thief. I suspect she has many sides to her. She has given tips, presided over countless forums and written scores of articles helpful to new bloggers. Many of us at one time or another have considered retiring but we’ve collected too many friends to totally give things away, so we find ourselves drifting back, paying visits and publishing the occasional post. We are hooked. Once the blogosphere has us in its grasp it won’t let go. I love visiting the Food Blogs. They form some of the most proactive and successful groups in the blogging community. Visit The Novice Gardener http://thenovicegardener.wordpress.com once a week to experience Fiesta Friday, a deliciously festive feast that gets the imagination going and sets the taste buds reeling. Leah of Cookbook Guru http://thecookbookguru.wordpress.com calls Guru Members a Collective and a Book Club. The blog is named after a monthly event where recipe books and their authors are discussed and celebrated. It is not an exclusive club, anyone can enter the events or just visit. That last is me. Cooking, experimenting and reinventing is hard work. Thankfully, the members love to cook and I love to eat. A symbiotic relationship, although I feel that I’m the one to benefit the most. Sometimes I give the recipes a go, but I’m just as happy reading the biographical notes and drooling over the luscious photos. Bookmarking them on my computer is a much tidier system than keeping cookbooks undusted and neglected on my bookshelf. The foodie groups are dedicated to keeping the festivities going and the experience alive. They are too busy sharing with each other and us and partying to waste time on counting visitors and views. I’d be tempted to come out of the cold if I enjoyed cooking. I find forty three years is enough, the daily grind has worn me down. But I’ve been thinking lately that I could make one exception. I’m longing to try a great recipe that I have for Southern fried Phoenix with coleslaw. Blogging seems to be a cocoon stage for some writers. For others, it’s a fun routine. I find it’s best to just set your own pace and love your blog, not let your blog become a chore. Anyway, things last as long as they need to last too. Actually, it’s my quarterly rant, Henry. I’m slowing things right down these days and won’t publish something I’m not totally satisfied with. If it slows down the stats, then so be it. I love my foodie friends whom have enriched my life beyond measure. Where they find their bliss in the kitchen I find mine outside, in the dune woods. But I am oh so grateful when they share their joys. 🙂 Good luck with that stat thing. I find I write a great deal but it does not come naturally. Writing doesn’t come naturally to me either. Practice helps, but it’s still hard work. Thanks for visiting and especially for commenting. You are the master chef of the dune woods. You’re right about writing not coming naturally. I imagine that your sort of composition isn’t easy either. Shout out is the least I can do, Sandra. Your posts have given me so much pleasure and I’ve learned a lot. A well written lament Mary. Have you come up with any ideas so your blog can put a smile on your face? Happy New Year, Mary! I’m gradually dipping my toes back into the blogging world. I thought I’d get around and visit for a while before posting again. I’m hoping to once again enjoy bloggers I felt close with (present company included), and I’d like to make new friends in new circles. I think foodies are a good place to start. Hope you are well, and I hope your stats soar in the new year! It will be lovely to have you back, Maddie. You’ll absolutely love the food blogs. I find the harder I try, the less things happen, so I’ve learned not to care much or worry about it. There are blogs I follow religiously who don’t pay any attention to me, and vice versa I’m afraid. You write some wonderful stuff which I’m sure pleases you, and that’s really all that matters. Thanks Gran. I don’t know if my stuff is wonderful or not, but it’s nice of you to say so. I’m not fast. It takes days and lots of rewrites. I ‘d love the occasional comment for all that work. Better still, it would be nice to have a discussion going. If I didn’t care , I’d be putting my pieces in the bottom drawer of my writing desk. I know I’m not on my own there.